Oregon contains three landscape-based parks managed by the National Park Service (Crater Lake, John Day Fossil Beds and Oregon Caves), together with two NPS historical sites, and two US Forest Service preserves - Oregon Dunes and Newberry Volcanic, popular both for recreation and scenery. There are also two locations (Hells Canyon and Nez Perce) for which most of the preserve is in neighboring Idaho. By far the most popular and well known natural attraction in Oregon, Crater Lake is a flooded caldera, one of the largest of around 40 volcanic peaks in the Cascade Range, which spans the whole state from south to north. The lake contains especially deep, blue, clear water, and may be viewed from many overlooks around the 32 mile loop road that circles the rim. One trail descends to the shoreline, others climb to nearby summits, while several longer paths cross the wooded backcountry, to other lakes and volcanic remains. Because of massive winter snowfall, the park is fully open for only four months a year. The main part of Fort Vancouver National Historic Site - the fort - is in Vancouver, Washington, but a smaller unit lies just across the stateline in Portland, Oregon; this preserves two historically important houses dating from the late 1840s. The rolling, grassy hills of north central Oregon contain many outcrops of fossiliferous rocks, and three locations are protected as a national monument, free to enter, and not often visited owing to the rather remote locations and lack of a spectacular central attraction. The park headquarters is in the Sheep Rock unit just off US 26; here are found a few viewpoints, short trails, and a historic homestead. 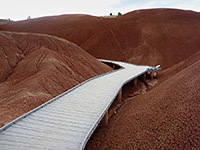 The other units are at Painted Hills, featuring amazingly colored badlands, and Clarno, the smallest of the three, containing a fossil-bearing cliff face. The NPS manage several sites around the mouth of the Columbia River in northwest Oregon, associated with the famous expedition of Meriwether Lewis and William Clark, who reached this location in the winter of 1805. Many fascinating geological features are contained within a 50,000 acre preserve in the Deschutes National Forest, south of Bend, centered around the caldera of Newberry Volcano, now partly flooded. 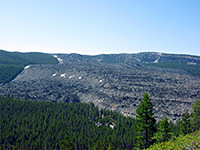 Nearby are other craters, lava flows, lava caves and a lava cast forest. 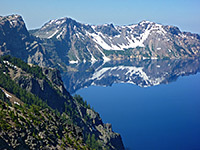 The national monument has two main centers, at Paulina Lake in the middle of the caldera, and at Lava Butte along US 97. Besides viewing the volcanic remains, the area is also popular for camping, fishing and boating. 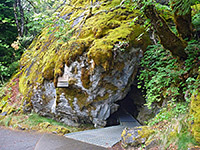 Hidden away in the Siskiyou Mountains, Oregon Caves is a small natural monument featuring several miles of spectacular passages through metamorphosed limestone, some of which may be viewed along 90 minute guided tours, offered several times a day from spring to fall. The monument may be closed by snow on some occasions during the winter, and is quite difficult to reach at other times owing to the steep, narrow, winding access road. Other attractions are several historic buildings, and a few trails across the surrounding, wooded hills. 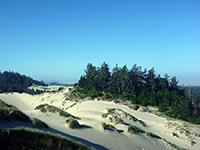 The Oregon Dunes form a break in the predominantly rocky Pacific coastline - a 40 mile strip of sand between Florence and North Bend, partly wooded but mostly lacking any vegetation. Inland, the sands merge with thick forest and varied watery environments of lagoons, creeks, marshes and lakes. US 101 runs through the area, staying a mile or more from the coastline, much of which is wild and rather inaccessible. The many recreational activities include camping, fishing, boating and ORV use, and while not a renowned hiking destination, the preserve has many trails, and the landscape is varied and scenic.